The Christmas season is celebrated and observed through the sharing of our blessings and gifts. We share with friends, family, visitors, guests, and strangers, and we often share through music—the heart of all Christmas festivities and observances. 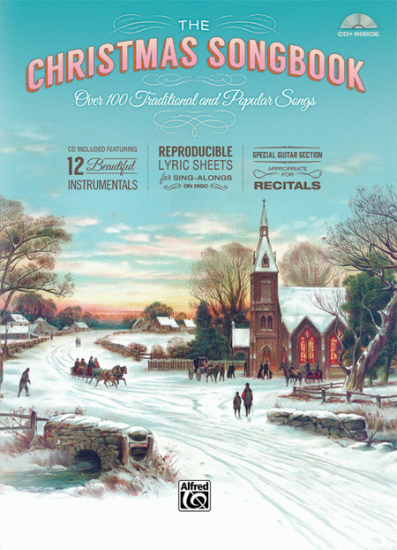 A true gift for family celebrations and sacred and secular commemorations, The Christmas Songbook is a beautiful hardcover book containing over 100 songs in lead sheet format—from sacred music and classic carols through popular tunes and instrumentals. Featuring an 8-page color insert, a foreword on the history of some of these timeless tunes, and a special section of 12 solo guitar arrangements suitable for recitals and special events, the book is your one stop for musical merrymaking. Finally, the book includes a free audio CD with performances of the 12 guitar instrumentals, and if you use the CD in your computer, you can access printable lyric sheets for every song in the book—perfect for sing-alongs! Titles: Angels from the Realms of Glory * Angels We Have Heard on High * As Lately We Watched * Auld Lang Syne * Away in a Manger * The Babe * A Babe Is Born in Bethlehem * Believe (from The Polar Express) * The Bells of Christmas * Blue Christmas * The Boar's Head Carol * Born Is He, This Holy Child * Breath of Heaven (Mary's Song) * Bright and Joyful Is the Morn * Bring a Torch, Jeannette, Isabella * Buon Natale (Means Merry Christmas to You) * Carol of the Birds * Celebrate Me Home * A Child This Day Is Born * Christ Was Born on Christmas Day * Christmas Comes Anew * The Christmas Song (Chestnuts Roasting on an Open Fire) * Christmas Vacation * Christmas Wrapping * The Coventry Carol * Dance of the Sugar Plum Fairy * December * Deck the Halls * Don't Save It All for Christmas Day * Emmanuel * Feliz Navidad * The First Noel * The Friendly Beasts * Gesu Bambino (The Infant Jesus) * The Gift * Go Tell It on the Mountain * God Rest Ye Merry, Gentlemen * Good Christian Men, Rejoice * Good King Wenceslas * A Great and Mighty Wonder * Hallelujah Chorus * Happy Xmas (War Is Over) * Hark! The Herald Angels Sing * Have Yourself a Merry Little Christmas * Here Comes Santa Claus * Here We Come A-Wassailing * The Holiday Season * The Holly and the Ivy * A Holly Jolly Christmas * Holy Night, Peaceful Night * (There's No Place Like) Home for the Holidays * Hush, My Babe, Lie Still and Slumber * I Heard the Bells on Christmas Day * I Saw Three Ships * I Wonder as I Wander * I'll Be Home for Christmas * In a Christmas Mood * It Came Upon the Midnight Clear * It's Christmas in New York * It's the Most Wonderful Time of the Year * Jingle Bells * Jolly Old Saint Nicholas * Joy to the World * Let There Be Peace on Earth (Let It Begin with Me) * Let's Have an Old-Fashioned Christmas * The Little Drummer Boy * Mary, Did You Know? * Mary Had a Baby * Mele Kalikimaka * Noel! Noel! * O Christmas Tree (O Tannenbaum) * O Come, All Ye Faithful (Adeste Fideles) * O Come, Little Children * O Come, O Come Emmanuel * O Holy Night * O Little Town of Bethlehem * On Christmas Night All Christians Sing * Once in Royal David's City * Patapan * Put a Little Love in Your Heart * Riu, Riu, Chiu * River * Rockin' Around the Christmas Tree * Rudolph, the Red-Nosed Reindeer * Santa Baby * Santa Claus Is Comin' to Town * Silent Night * Silver and Gold * Simple Gifts * Sleigh Ride * Stand Beneath the Mistletoe * Star of the East * The Twelve Days of Christmas * Up on the House Top * We Three Kings of Orient Are * We Wish You a Merry Christmas * Welcome Christmas (from How the Grinch Stole Christmas!) * What Child Is This? * When Christmas Comes to Town (from The Polar Express) * You're a Mean One, Mr. Grinch (from How the Grinch Stole Christmas!) * 'Zat You, Santa Claus?